February is a great time to focus on my heart. It is Valentines Day, of course, but more importantly, the health of my heart should come into focus. My family has a genetic predisposition to heart disease. So I am careful to eat healthy, but I definitely need to exercise more. I know, I know--you say I work outside and ranching is a physically demanding job. But it isn't cardio exercise! I do need to be able to lift, and I do walk quite a bit--but not enough. So with the coming of warmer weather later this week, I pledge to get back to walking 4 miles at least 3 times a week. I also plan to eat lots of lean beef. Did you know that the actual fat profile of beef has changed since I've been a rancher? Seriously! This graph shows the fatty profile of beef. 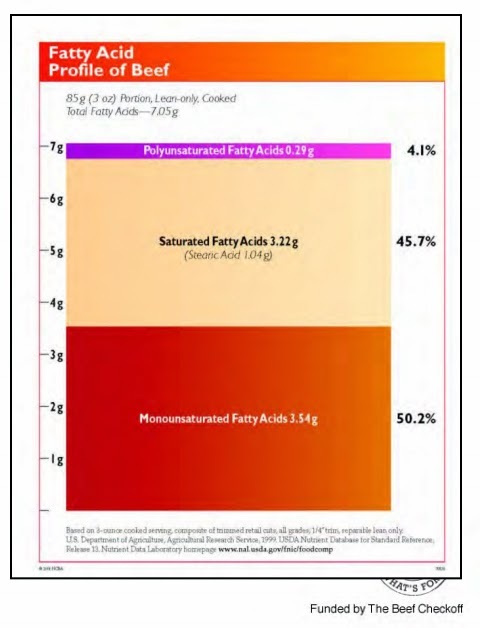 If you are a dietician or nutritionist, you may understand this without explanation, but it took me having someone explain it....briefly, it says that more than half of the fat in beef is Monounsaturated Fat. That is the same type of fat found in typical heart healthy foods like salmon and olive oil and is commonly known as the "healthy fat!" I believe this amount has dramatically increased through the years because of dedicated cattle breeding programs. I am a "seedstock breeder" which means my cattle are not usually the ones we eat. They are the genetics (or the seeds) kept to breed to produce the cattle we will eventually eat. Through the years, seedstock ranchers have developed tests to predict the carcass makeup of the calves that will be produced. So the day a calf is born, I can take a DNA sample (usually a hair follicle or blood sample) and have it tested and they can now show how much marbling will be in that little calf's muscle when he is grown. The marbling, or intramuscular fat, has been proven to contain more Monounsaturated Fat than the outside fat, or intermuscular fat. And, we are cutting that outside fat off...and...through the same DNA test, I can tell if that calf will have more or less outside fat as well! So we select for calves who will have higher levels of Marbling and lower levels of Outside Fat. Those genetic traits have been proven to be highly heritable, so that means they will pass the trait on to their calves. BOOM! There you have it, in a nutshell. Beef fat profiles have changed and it can be traced in part to the efforts of good ranchers. 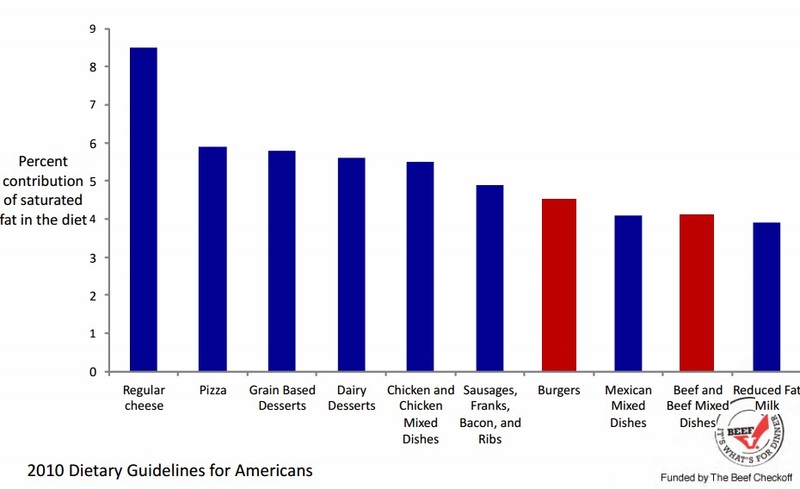 I also found this graphic...very interesting about how Americans actually consume fat. No surprise, though. Looks like beef is pretty far down the list of the fatty foods we consume. If you are interested in more information about beef nutrition, please check out this site: BeefNutrition.org and watch for a few more Heart Healthy posts from me this month. Also for information about the BOLD study and the diet containing lean beef, check out this link: Bold Research Fact Sheet. Now, I think I'll go thaw out a couple of steaks for supper tonight! Toss up a salad and some green beans on the side, and I have a happy hubby--maybe he'll even buy me some flowers for Valentine's Day this week! HINT, HINT!! This is good news! Hellooooo Steaks! Yes, it is good news!! And a great reason to keep beef as an important part of your healthy diet!